Yesterday morning, I checked out of the hostel and into a hotel. This was planned, and had nothing to do with the bedding fiasco. I have learned to change accomodations every 3 days or so, even in the same city, to beat monotany and also provide a new perspective. Usually when booking hotels, I get a cheap one that is no comparison with any Western-style chain. Many times, there are no elevators, shared bathrooms, etc. Ocasionally though, I don't spend much but luck out and get a place that can compare favorably with a major chain. And that is what happened this time. After staying in a hostel, I don't take a normal hotel for granted. I can appreciate everything, from the uniformed man and woman at the front desk, legitimate elevators, a key card (Which if you lose you get another for free-vs real keys where you pay a hefty fine if you lose), bathroom with toiletries, etc. After checking in yesterday, I took an hour-long nap, and slept until 8:00 this morning (late for me). Upon completing my nap, I walked to the Plaza Mayor for another walking tour called Majestic Madrid, sort of a sequal to the free tour I completed the other day. This was a nice tour, with the tour guide showing the group where the writer of Don Juan lived, where his adversary lived (on the same street), and also various statues around town. The tour guide spoke with a British accent, although insisted has no connection to Great Britain and has never lived there. She dated a British guy once, and that was it. She even used the terminology loo for bathroom. A British couple in our group thought she was British. According to her, she was just born and raised in Madrid. After the tour, I went to a bullfight. I enjoy participating and watching activities indigenous to a culture. Ie, going to a wax museum, showing statues of Pres Obama and Marilyn Monroe in Madrid (which exists, by the way), doesnt' make sense to me, but a bullfight in Spain makes perfect sense. ME OK. What's the website? And she gave me the website, which didn't work when I tried it. I found out how to get tickets, which I did. 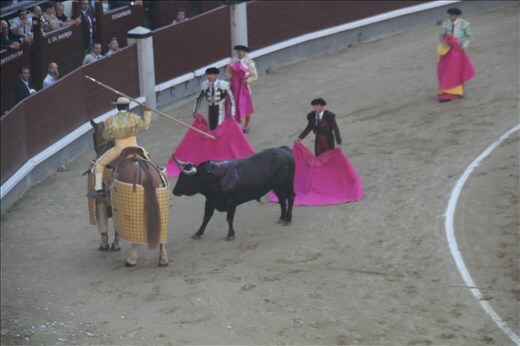 And I found out the rep was not simply being rude-many are ashamed of bullfighting, and now that I saw part of one I can see why. The tour guide from the aftertnoon tour got emotional when she talked about her objection to bullfighting, and also mentioned it was outlawed in other parts of Spain. The stadium was hot, and the seats we're made of cement, (they sell cushions which I bought, but they are still pretty uncomfortable). The bull comes out, five people try to fight him, they stick spears in him, the bull eventually starts coughing blood, and he rolls over and dies, and the crowd cheers. To see an animal (particularly one that hasn't harmed anyone) hurt, coughing blood, and dying and thousands of people cheering is a sensation that cannot be accurately conveyed by TV, movies, Youtube, etc. On one hand I guess I am glad I experienced it firsthand, on the other I sort of wish I could unsee what I saw. I left after the first fight (about 20 minutes), and went back to the main part of Madrid, where I wandered around watching people, etc.